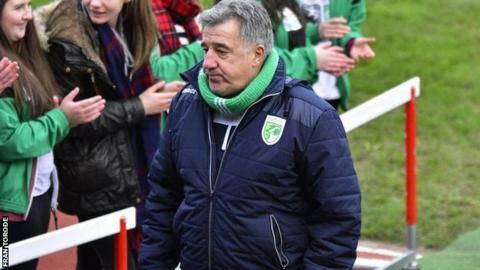 Guernsey FC coach Colin Fallaize says he is "not even thinking" of the team finishing in the Isthmian League Division One South play-offs. The Green Lions are on a club-record run of five consecutive losses and are six points behind fifth place. "The play-offs, as far as I'm concerned, are something in the future," Fallaize told BBC Guernsey. "What we're doing on the pitch is not going to be good enough to be competing in those play-offs anyway." The Channel Islanders had been on an nine-game unbeaten stretch up until mid-January, but failed to pick up a single point last month. Their most recent defeat was a 4-1 reverse at home to fellow play-off chasers Hastings. "Right at this moment I'm not even thinking of the play-offs, I'm thinking that we have to improve our performance," added Fallaize. "We've got to get another win. We don't shy away, we need the fans to stay with us. "They (the players) must, right at this moment, be thinking 'football stinks'. "Well, football is a great game because it challenges you and if you can't rise to the challenge, don't play at this level."